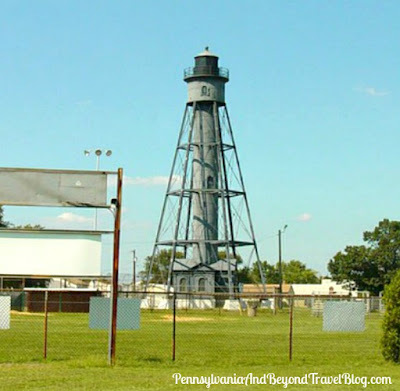 The historic Tinicum Rear Range Lighthouse is located in Paulsboro, New Jersey. You'll find it sitting along the shore of the Delaware River at Second Street and Mantua Avenue. The lighthouse is open for tours April through September on the third Sunday of each month, and during the third weekend in October for the New Jersey Lighthouse Challenge. Admission is FREE, but a monetary donation is appreciated. All donations go towards maintaining this beautiful lighthouse and keeping it open for all of us to enjoy. You can contact them directly if you wish to visit the lighthouse at other times or to obtain a list of upcoming events. Tinicum Lighthouse started its operations back in 1880 and stands 85 feet tall. It's made out of steel and has 112 steps that lead to the lantern room. A lighthouse keeper's house used to sit nearby that contained 7 rooms, a frame barn, barnyard, shed, etc. All of this is on 4+ acres of land. Sadly though, only the lighthouse remains. Unlike some of the other lighthouses throughout the nation, Tinicum Rear Range Lighthouse is still being used as a navigational aid for those traveling up and down the Delaware River. According to their official website, it features a fixed red light exhibiting 500,000 candlepower from a 1,000 watt lamp.